Dutch Flower Auction Direct Blog - New! Chinese New Year Social Club Box! New! Chinese New Year Social Club Box! February the 5th marks Chinese New Year, in celebration we are releasing a limited edition Social Club Box, full of traditionally lucky flowers for you to arrange in the home, which will hopefully bring you prosperity in the year ahead! Order now for our first available delivery date - 30th January orders made between this time will be dispatched same day if ordered before 11am or next day if after. Our Social Club Boxes are designed for you to arrange your own beautiful bouquet at home. Priced at just £30 you will receive between 20-30 stems of fresh flowers and foliage per box, specially selected by our designers. 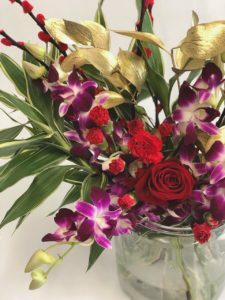 Your flowers will arrive carefully packaged straight to your doorstep, ready for you to work your magic and arrange at home! Our boxes are made from 85% recycled materials! 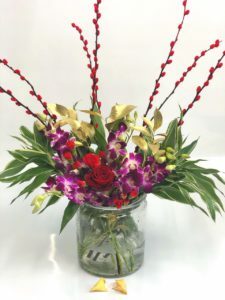 Our Chinese New Year Box consists of - 8 stems of red pussywillow, 10 stems of dracena, 1 red rose, 5 stems of purple dendrobium orchids, 5 stems of red spray carnations and 3 stems of gold ruscus. All traditionally lucky varieties, colours and numbers from Chinese culture. 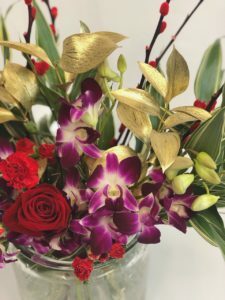 We hope that filling your home with these fresh blooms will bring you prosperity in the new year! 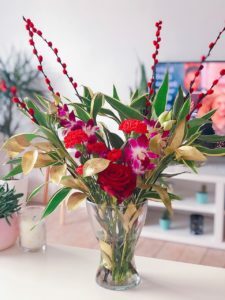 We'd love to see photos of how you've arranged your stems at home! Either email info@dutchflowerauctiondirect.com or drop us a message via one of our social media pages!